What a great use as a planter…. an old child’s wagon. It really opens up your mind to see such great usage of an old object that most would just throw away. What other type of objects…. both old and new…. that is readily thrown away can you think of that would make a great planter? Have you already up-cycled an item? Would love to see pics that I could share! 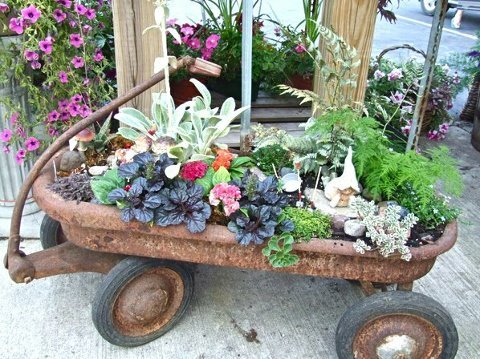 This entry was posted in Antiques, ~Gardening, ~Gardening/Yard and tagged antique, Enthusiasts, flower, flowers, Garden, gardening, herb, herbs, Recreation, recycle, Station wagon, up-cycle, Wagon, Wagon train, Wikipedia. Bookmark the permalink.